The photos below illustrate a catastrophic failure of a Glock 21. Again, this incident did not happen at Front Sight Firearms Training Institute, but is one of many reasons why Front Sight has always required students to use factory, new ammunition. The shooter of this pistol was using reloaded, full metal jacket ammunition. To the best of our understanding of the incident, the cartridge case was not sized properly, preventing the action from locking up fully, but allowing the action close enough to fire the weapon. The result was an open breach detonation of the cartridge. The photos speak for themselves. The shooter received severely bruised hands, with minor to moderate lacerations to his hands and face. We have received reports of similar incidents with the Glock 21 and I have personally witnessed a less dramatic incident with a Glock 21-magazine blown out of the weapon and shooter's hand bruised. In all incidents reported, reloads were used. Front Sight recently witnessed damage to a Glock 21 .45 ACP using factory new, American Ammunition manufactured in Miami, Florida. We also received a report from another Front Sight student that had the same experience with a Glock 22 .40SW using the same ammunition manufacturer. In both cases the students suffered bruising on their hands and some minor lacerations. In both cases, the failures occurred after a few hundred rounds of ammunition fired. The problem appears to be caused by the fact that American Ammunition uses is "copper coated" not copper jacketed bullet. Due to the type of rifling in Glock barrels, Glock recommends using only factory new, copper jacketed ammunition. Soft, lead bullets and copper coated or copper washed bullets, build up a a lead residue at the beginning of the barrel (just in front of the chamber) which in time will dramatically increase the chamber pressure upon ignition. 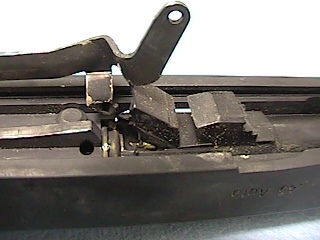 The increased chamber pressure causes the case to rupture on the unsupported area of the case, thus blowing out the magazine and lower aspect of the frame. Since 1996, with tens of millions of rounds fired from handguns, shotguns, rifles, and submachine guns, by tens of thousands of students each year, Front Sight has experienced only a very few, self-inflicted gunshot wounds. All of these unintentional, self-inflicted, injuries were the result of improper gunhandling associated with the holster. About half of the injuries occurred when students negligently discharged their weapons into their leg while presenting a pistol from the holster. About half occurred when students negligently discharged their weapons into their leg while holstering their pistols. One occurred when a student negligently discharged his weapon into his hand while presenting his weapon from the holster. The good news is that these students recovered completely and would like others to learn from their mistakes. Incident occurred on February 15, 1999, the fourth day of a Four Day Defensive Handgun course at approximately 12:15 p.m.
15 students on the firing line with six Front Sight instructors observing and instructing the 15 students on the firing line. A ratio of one instructor for every 2 to 3 students. Student has been "shooting for years" and was doing very well in the course with no indications of improper procedures or safety violations. Student was presenting weapon from concealed holster when incident occurred. Weapon used was a stock Sig 229 .40 S&W with no modifications. Student previously shot over 7000 rounds through the weapon without incident. Bullet was 180 grain, full metal jacket, flat point. Physical evidence of the spent case failing to eject from the weapon and powder burns on the student's pants at the muzzle end of the holster, indicate that the weapon was fired while the gun was coming out of the holster, but still partially in the holster. The bullet entered the lateral aspect of his upper thigh about 5 inches below the point of the hip, traveled deep into the thigh, past and across the back of the knee, and into the lower leg, finally stopping on the medial side of the lower leg about six inches from the ankle. The bullet could be felt lodged ¼ inch under the skin. Total penetration was about 22 inches. Immediate action taken at range was to assist student off the range; radio ambulance; locate entrance wound; locate any exit wounds (bullet found lodged just below skin in lower leg) establish distal pulses; apply pressure to femoral artery; keep student's attention off his injury with casual conversation and questions; prevent shock and transport to ambulance. Student was transported in patrol car of one of Front Sight's instructors along with Dr. Piazza, Front Sight's, Founder and Director and EMT Shannon Long. Patrol car radioed ahead to meet ambulance to shorten response time. Life Flight helicopter dispatched to rendezvous site. Decision made by Life Flight and ambulance crew to transport student by ground to Trauma Center-located 18 minutes away. Student's heart rate remained in the 60 - 70 beats per minute range from the time pulse was first taken, immediately following the injury and throughout transport to the hospital. Blood pressure remained steady. Student remained calm and coherent, answering random questions regarding current events. X-rays revealed that the bullet did not strike any bones and did not deform. Angiogram revealed no vascular damage. Orthopedic neurologic examination revealed full motor control of extremity with discomfort and slight tingling sensation in lateral aspect of lower leg. Student remained in hospital overnight for observation and was walking the next day at physical therapist's direction. Student fully recovered in approximately eight weeks. This student was VERY LUCKY. When I first observed the location of the entrance wound on the lateral aspect of the upper thigh and the bullet was found lodged in the medial aspect of the lower leg, my immediate thoughts were broken leg, internal bleeding, and permanent nerve damage. The fact that no bones, arteries, veins, or nerves were damaged is truly amazing. Equally amazing was the calm and cool attitude of the student. We kept checking his pulse because we expected it to be higher than 60 to 70 beats per minute. His stable blood pressure, strong distal pulses, and lack of swelling or discoloration indicated that his injury was much less severe than it could have been. Diagnostic tests at the hospital confirmed that he had no major damage. Again, it could have been much worse. He is very fortunate. The student sent his Sig P229 to a competent gunsmith for evaluation of any part failure that could have caused the weapon to discharge. The student did not recall placing his finger on the trigger and firing the weapon. The gunsmith analysis failed to find any malfunction in the weapon. Speculation is that the student may have failed to fully depress the decocking lever or depressed the slide release lever, thinking he had depressed the decocking lever. This resulted in holstering the weapon with the hammer cocked back on a loaded chamber. Upon hearing the whistle to present his weapon, he swept the concealment garment away, established the proper firing grip with finger along the outside of the holster. As he began to withdraw the weapon from the holster, he may have violated Safety Rule 3 and allowed his finger inside the trigger guard which contacted the lighter, single action trigger instead of the heavier double action trigger causing the weapon to fire. Another possibility, although much less likely is that upon sweeping the concealment garment away, it caught the hammer and cocked the weapon, resulting in the same hammer back condition. Either way, the main problem is a violation of Safety Rule 3. Please remember that the proper draw stroke involves keeping your finger out of the trigger guard and off the trigger until the weapon is placed on the target and sight alignment is acquired. Any violation of Safety Rule 3-Keep your finger off the trigger until your sights are on the target-will result in a negligent discharge of the weapon. The only way a weapon can be fired is to contact the trigger and press the trigger. Incident occurred December 11, 2000 on the first morning of an instructor development course. The instructor candidate, a 22 year combat veteran of the U.S. Marine Corps, had never attended a handgun course at Front Sight and was trying out for instructor positions with 67 other candidates of equally impressive backgrounds. Earlier in the morning, the student had switched from a leather holster to a Kydex holster. 17 students on the firing line. 5 Front Sight instructors observing and instructing the 17 students on the firing line. A ratio of one instructor for every 3 to 4 students. All students were warming up with dry practice drills prior to the morning Skills Evaluation Test to allow the instructors to watch for any potential safety violations or unsafe gun handling. This student demonstrated a smooth, quick presentation, keeping his finger outside the trigger guard until his sights were on the target. Upon holstering the weapon he also maintained proper trigger finger placement - outside the trigger guard, along the side of the frame. He holstered the weapon numerous times without any indication of problem or malfunction. Weapon used was a Colt Gold Cup 1911 .45ACP with a long, wide trigger that is the same width as the trigger guard. Student had owned the handgun for approximately one year. Immediately following the first controlled pair shots, while holstering the weapon, a negligent discharge occurred. Bullet was 230 grain, full metal jacket, hollow point. Physical evidence of the spent case failing to eject from the weapon and powder burns on the student's pants from the muzzle end of the holster, and eye witness reports indicate that the weapon fired when the gun was fully seated into the holster - with the student's finger off the trigger. The bullet grazed the lateral aspect of his upper thigh for approximately 12 inches and struck the lateral aspect of his boot at the base of the small toe, deflecting off the boot. The bullet was later recovered on the range. The hollow point was filled with the student's pant material and deformed without expansion. Immediate action taken on the firing line was to first convince the student that he had in fact been injured as he did not realize he was wounded. Two of Front Sight's twelve, on-site medics walked with the student off the range and assisted him in removing his pants and boots. Removing his pants and boots revealed a straight line of tissue damage approximately 12 inches in length down the lateral aspect of his thigh. The surface layers of skin had retracted in some areas to produce a very nasty looking wound, yet remarkably superficial. He also had a bruise developing at the lateral base of his small toe. First aid in the form of a compression bandage and vital sign monitoring was administered by Front Sight's EMT. The student remained remarkably calm with strong vital signs, and relatively no signs of pain from the injury. The student requested to return to the firing line to complete the course. Upon evaluating the injury, physical and mental status of the student, Dr. Piazza assigned Front Sight instructor Fred Jones (retired police officer and EMT trained) to transport the student by ground transportation to the local emergency room - a 20 minute drive from the training site. In transit to the emergency room, the Sheriff's office was notified of the incident with no further action needed. Emergency room treatment included cleansing the wound, bandages, and an antibiotic prescription and over the counter anti-inflammatory/pain medication. Inspection of the Gold Cup 1911 and Kydex holster revealed the problem. The Gold Cup has a long and wide trigger. The holster the student purchased was for a standard Government Model 1911. The holster is equipped with plastic recesses that fit into the trigger guard to secure the weapon into the holster. The combination of the wide trigger on the Gold Cup, holster designed for a standard Government Model, and THE THUMB SAFETY NOT PROPERLY ENGAGED UPON HOLSTERING, created the potential for the weapon to fire upon holstering. It is clear that the student holstered the weapon with his finger outside the trigger guard, but failed to properly engage the thumb safety. As the pistol was holstered, with the thumb safety off, the long, wide trigger came in contact with the kydex holster, discharging the weapon upon fully seating in the holster. There is some speculation that the frame of the weapon may have moved forward under the slide with just enough movement to further engage the trigger on the holster, but not so far as to disengage the firing mechanism. EITHER WAY, THE INCIDENT WOULD HAVE BEEN PREVENTED HAD THE THUMB SAFETY BEEN PROPERLY ENGAGED UPON HOLSTERING. Student returned that afternoon and completed the four day instructor development course with a Glock 9mm and holster supplied by Front Sight. This retired Marine is a very stout individual, both mentally and physically. Front Sight does not recommend the Gold Cup design as a self defense weapon for many reasons- the long wide trigger design being one of the reasons. Other reasons include: numerous sharp edges requiring dehorning; tight tolerances that may enhance inherent accuracy, but adversely affect reliability; adjustable sights that are not required, have sharp edges and can loosen under repeated use. Front Sight does use and recommends the Kydex type holster. All of our instructors wear Kydex holsters. In this incident, equipment played a part in the negligent discharge. The combination of the long and wide Gold Cup trigger, and the Kydex holster with its trigger guard securing design created the potential for a negligent discharge to occur should the thumb safety not be engaged. However, we must recognize that the failure to employ the thumb safety on a 1911 pistol-any 1911 style pistol-is a violation of proper gun handling with the single-action, auto-loading pistol and is the underlying cause of this unfortunate incident. Incident occurred on January 27, 2003, the fourth day of a Four-Day Defensive Handgun course at approximately 8:25 a.m.
16 students on the firing line with six Front Sight instructors observing and instructing the 16 students on the firing line. A ratio of one instructor for every 2 to 3 students. The student was a seasoned shooter, having first received instruction at another school in 1988. Interestingly, the student first met Dr. Piazza in that course in 1988 and Brad Ackman (now Front Sight's Operations Manager) was an instructor in that course. The student is the Range Master for his police department in California. Student was presenting his weapon from concealed holster when the incident occurred. Weapon used was a full-size Para Ordnance in 45 ACP. Bullet was Winchester 230 grain, full metal jacket, "ball". The student was shot in the support (left) hand. The bullet entered the palm side of the hand near the web between the thumb and forefinger. The bullet exited through the back of the hand. Physical evidence, eye-witness accounts, and the student's own description of the event support the premise that the student placed his support hand in front of the muzzle and fired one shot. Immediate action taken at range was to administer first aid, assist the student off the range, and telephone for ambulance transport. On-site medical care was delivered by Front Sight's EMT's and Paramedics. Medical care was in the form of a compression bandage and vital sign monitoring. The student was in considerable pain but was able to move each of his fingers and had sensation in each of his fingertips. In transit to the emergency room, the Nye County Sheriff's office was notified of the incident with no further action needed. The student contacted Front Sight's corporate office from the Emergency Room and stated that the injury was no one's fault but his own. He also stated that he was trained to draw the gun at (previous school) with the support-side hand out in front of the body. "I reverted to how I was taught at (previous school) and when I brought the weapon up, the muzzle must have run into my hand and I pulled the trigger." The student is expected to make a complete recovery and looks forward to returning to Front Sight as soon as his hand heals. On a follow-up call, the student stated "You guys at Front Sight are teaching the right stuff. I wish all police officers received your training in the academy. Keep up the good work". This student, like the two described above, arrived at Front Sight with years of practice in the techniques which were less than state-of-the-art. For years, this student diligently practiced a technique of presenting the handgun from the holster which, although accepted in 1988 and is still in use today throughout the industry, can create the type of problem the student experienced. Long ago, Front Sight recognized the peril in this and numerous other techniques taught throughout the industry. 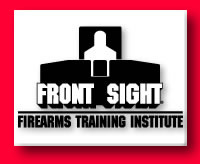 Before Front Sight began training its first students back in April 1996, we chose or developed techniques which were not only most effective in a gunfight and also the safest for the student. Placing his support side hand (in this case his left hand) out in front of his body and in line between the holster and the target. Disengaging the thumb safety of his weapon sooner than Count 4 of the presentation. Placing his finger on the trigger before the weapon intersected his line of sight. Firing the weapon before both hands were securely on the frame of the weapon and his sights were on the target. Below are two suites of photographs. The first suite describes the proper presentation of a handgun from a holster. The second is a recreation of the events which resulted in an injury for the student. The model in the photographs below is using an inert, plastic training weapon or "red gun". This photograph shows an incorrect Count 1. Notice the support hand is out in front of the body. This photograph shows an incorrect Count 2. Notice the support hand is still out in front of the body. This photograph shows an incorrect Count 3 and several other mistakes which led to the injury. The support hand is out in front of the muzzle instead of on the frame of the weapon where it belongs. 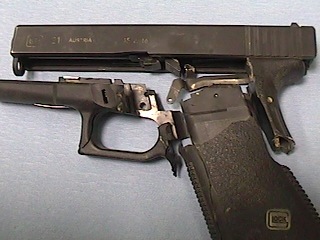 The 1911 safety (not visible in this image) is off. The finger is on the trigger. And finally, the student pressed the trigger to fire the shot and receive the injury. Incident occurred on June 12, 2004, the second day of a handgun course at approximately 12:15 p.m.
Three students were on the firing line with one Front Sight Range Master. Obviously, this represents a ratio of one instructor for every three students. The students were at 7 yards and shooting at turning, electronic targets. The student was doing very well in the course with no indications of improper procedures or safety violations. The student was presenting his weapon from an exposed (not concealed) holster when the incident occurred. Weapon used was a Glock 35 .40 S&W with no modifications. The student had previously shot thousands of rounds through the weapon without incident. Bullet was 165 grain, full metal jacket, truncated cone. Powder burns on the student's pants and at the muzzle end of the holster indicate that the weapon was fired while the gun was partially in the holster. Immediate action taken on the firing line was to first convince the student that he had, in fact, been injured as he did not realize he was wounded. The student was cared for by two of Front Sight's twelve, on-site medics and a fellow student who is a practicing Medical Doctor. The bullet entered the lateral aspect of the upper thigh about 5 inches below the point of the hip, traveled just under the skin for approximately three inches, exited from under the skin, and then grazed along the outside of the thigh for another 4-5 inches. The bullet struck the ground near the student's feet and was not recovered. First aid in the form of a compression bandage and vital sign monitoring was administered by Front Sight's EMT's. The student remained remarkably calm with strong vital signs, and relatively no sign of pain from the injury. The student requested to return to the firing line to complete the course. The student was transported in private car with one of Front Sight's EMT's to a hospital emergency room in Las Vegas. Hospital care of the wound included irrigation, X-rays, and a prescription for antibiotics. The student returned from the hospital the same evening and rejoined his course the next day. The students were shooting at turning electronic targets. A fellow shooter adjacent to the student "jumped the gun" and prematurely presented his weapon before the targets had turned. The student of interest saw the motion of his fellow shooter and also started his presentation too early. The student placed his finger on the trigger just as the weapon cleared the top of the holster. Note: this is NOT the correct time to place the finger on the trigger. The finger should be placed on the trigger only when the shooter is ready to fire (just before the weapon is at eye level). The student wanted to holster his weapon quickly so he would be ready when the targets actually turned. However, his finger was still on the trigger as he attempted to reholster. This was clearly a violation of Safety Rule #3; Keep your finger off the trigger until you are ready to shoot. The top of the holster hit the student's trigger finger which, in turn, pressed the trigger causing the negligent discharge. Even the most experienced shooter must continually evaluate his techniques to make certain they are being performed correctly and safely. See the photographs and descriptions above describing the proper sequence for presenting a handgun from the holster. Remember: There is no hurry to holster a weapon. To safely holster you simply reverse the sequence of presenting the weapon. This unfortunate and extremely rare incident at Front Sight could have been avoided by following Safety Rule #3. Keep your finger off the trigger until you are ready to shoot. Incident occurred on November 14, 2005 , the final day of a four-day defensive course at approximately 4:15 p.m.
15 students were on the firing line along with the Front Sight Range Master, Instructors and other Line Coaches. The students were at 5 yards and shooting at turning, electronic targets. The student was presenting his weapon from a concealed holster when the incident occurred. Weapon used was a Sig 9mm handgun with no obvious modifications. Bullet was 115 grain, full metal jacket. Powder burns on the student's pants and at the muzzle end of the holster indicate that the weapon was fired while the gun was at least partially still in the holster. The student was immediately cared for by two of Front Sight's medics and a fellow student who was also a medic. The bullet entered the lateral aspect of the upper thigh about five inches below the point of the hip, traveled just under the skin for approximately five inches, exited from under the skin at about mid-thigh. First aid in the form of a compression bandage and vital sign monitoring was administered by Front Sight's EMT's. The student remained remarkably calm with strong vital signs, and relatively no sign of pain from the injury. The student was transported by helicopter to a hospital emergency room in Las Vegas . The student was cared for at the emergency room and discharged within two hours. The student stated that he probably did not decock the hammer after his last firing drill and before holstering. This resulted in the holstering a loaded weapon with the hammer cocked. On the next presentation or "draw stroke" of his weapon, he swept the concealment garment away, established the proper firing grip with finger along the outside of the holster. As he began to withdraw the weapon from the holster, he likely violated Safety Rule 3 and allowed his finger inside the trigger guard which contacted the lighter, single-action trigger instead of the heavier double-action trigger causing the weapon to fire. Remember that the proper draw stroke involves keeping your finger out of the trigger guard and off the trigger until the weapon is pointed downrange at the target. Again, the only way a weapon can be fired is to press the trigger. Incident occurred on November 11, 2007, the third day of a four-day defensive course at approximately 4:05 p.m.
19 students were on the firing line along with the Front Sight Range Master, two other Instructors, plus all Line Coaches for a 1-to-1 ration of students to coaches. The students were at 10 yards and shooting at turning, electronic targets. The student, a seasoned Deputy Sheriff from San Joaquin County, California was presenting his weapon from a concealed holster when the incident occurred. Weapon used was a San Joaquin County Sheriff’s Department issued Sig 40 caliber handgun with no obvious modifications. Bullet was a Department issued 180 grain, hollow point. The bullet passed through the pants and entered the upper thigh about five inches below the point of the hip. There was no exit wound. The student was immediately cared for by two of Front Sight’s medics. First aid in the form of a compression bandage, supplemental oxygen, and vital sign monitoring was administered by Front Sight’s EMT’s. The student remained remarkably calm with strong vital signs. The student was transported by ground ambulance to a hospital emergency room in Las Vegas. The bullet had lodged behind the knee and was surgically removed. The student commented that he probably did not decock the hammer after his last firing drill and before holstering. This resulted in the holstering a loaded weapon with the hammer cocked. On the next presentation or “draw stroke” of his weapon, he swept the concealment garment away, established the proper firing grip with finger along the outside of the holster. As he began to withdraw the weapon from the holster, he violated Safety Rule 3 and allowed his finger inside the trigger guard which contacted the lighter, single-action trigger instead of the heavier, double-action trigger causing the weapon to fire. Incident occurred on June 7, 2008, the final day of a two-day Handgun Skill Builder course at approximately 4:15 p.m. Approximately 15 students were on the firing line along with the Front Sight Range Master, Instructors and other Line Coaches. The student was shooting a 1911 handgun and using 230-grain hard ball ammunition. The students were at at the "Dry Practice Line" performing malfunction drills during the Skills Test near the end of the course. The student had completed the exercise and was holstering. However, he violated two fundamental safety procedures by leaving the thumb safety disengaged and his trigger finger on the trigger. If these two safety violations had not occurred, there would not have been a Negligent Discharge. When his trigger finger contacted the top of the holster, the weapon discharged. Powder burns on the student's pants and at the muzzle end of the holster indicate that the weapon was fired while the gun was at least partially in the holster. The student was immediately cared for by Front Sight's medics and a fellow student who was also a medic. The bullet entered the lateral aspect of the upper thigh a few inches below the point of the hip, traveled just under the skin for approximately nine inches, exited from under the skin just above the knee. First aid in the form of a compression bandage and vital sign monitoring was administered by Front Sight's EMT's. The student remained remarkably calm with strong vital signs. The student was cared for at the emergency room and later released. The student returned to Front Sight the next day to thank the Front Sight medic staff for their assistance. The student did not engage the thumb safety and place his trigger finger straight along the side of the frame after his last exercise and before holstering. This resulted in holstering a loaded weapon with the safety off and finger on the trigger. Adhering to the proper safety rules and correct gunhandling is the only way to guarantee safe weapons handling. Incident occurred on May 22, 2010, the second day of a Two-Day Defensive Handgun course shortly before noon. Approximately 16 students were on the firing line along with the Front Sight Range Master, Instructors, and other Line Coaches. The student was shooting a Springfield Armory 1911 handgun and using 230-grain factory hard ball ammunition. The students were on the firing line shooting controlled pairs at static targets from exposed holsters (no concealment). The student was performing well with no indications of safety violations. Powder burns on the student’s pants and at the muzzle end of the holster indicate that the weapon was fired while the gun was at least partially in the holster. The bullet passed through the student’s pants several times as it traveled down the length of the leg. The bullet left an abrasion on the firing side calf but never entered the leg. The bullet came to rest in the ground adjacent to the shooter’s foot. The student was immediately cared for by Front Sight staff. First aid in the form of a compression bandage and vital sign monitoring was administered by Front Sight staff. The student remained calm with strong vital signs. The student wanted to continue training but was encouraged to seek professional medical attention. The student was transported by a family member to the emergency room and was soon released. Incident occurred on June 21, 2010 , the final day of a four-day defensive course at approximately 4:30 p.m.
18 students were on the firing line along with the Front Sight Range Master, Instructors and other Line Coaches. Weapon used was a Springfield Armory XD 45 ACP handgun with no obvious modifications. Holster was an unmodified, Blackhawk Serpa CQC designed for the Springfield XD. Bullet was 230 grain, full metal jacket. The student was immediately cared for by Front Sight's staff. The bullet entered the upper thigh just below the belt and forward of the holster. The bullet traveled just under the skin for approximately 18 inches, exited from under the skin at about knee level. The bullet struck the ground near the student's feet and was recovered. First aid in the form of a compression bandage and vital sign monitoring was administered by Front Sight's staff. The student remained remarkably calm with strong vital signs. On the presentation or "draw stroke" of his weapon, the student swept the concealment garment away, established the proper firing grip with finger along the outside of the holster. As he began to withdraw the weapon from the holster, he likely violated Safety Rule 3 and allowed his finger inside the trigger guard and subsequently pressed the trigger causing the weapon to fire. Incident occurred on February 7, 2011, the final day of a four-day defensive handgun course at approximately 2:00 p.m.
19 students were on the firing line along with the Front Sight Range Master, two other Instructors, plus all student Coaches for a 1-to-1 ratio of students to coaches. The students were at 7 yards shooting head shots from a concealed holster. Weapon used was a Springfield XD 40 caliber handgun with no obvious modifications. Bullet was a 180 grain, full metal jacket "ball" round. The holster was a Blackhawk Serpa designed for the XD and was equipped with a trigger guard retention device. The bullet hit the top of the holster before passing through the pants and entering the upper thigh about five inches below the point of the hip. There was no exit wound. The student was immediately cared for by two Front Sight staff members. First aid in the form of a compression bandage, supplemental oxygen, and vital sign monitoring was administered by Front Sight staff. The student remained remarkably calm with strong vital signs. The student was transported by helicopter to a hospital emergency room in Las Vegas. The bullet had lodged near the knee and was left in place by the physicians. The student was released from the hospital in under two hours. The student commented that when he presented the weapon, his finger slipped onto the trigger after disengaging the retention device of the holster. This is a clear violation of Safety Rule 3 which caused the weapon to fire. Remember that the proper "draw" stroke involves keeping your finger out of the trigger guard and off the trigger until the weapon is pointed downrange at the target. Again, the only way a weapon can be fired is to press the trigger. Incident occurred on April 12, 2011, the second day of a four-day defensive handgun course at approximately 3:20 p.m.
18 students were on the firing line along with the Front Sight Range Master, three other Instructors, plus the student coaches for a 1-to-1 ratio of students to coaches. The students were at 7 yards and shooting controlled pairs from an exposed holster. Weapon used was a Springfield 1911 45 ACP caliber handgun with no obvious modifications. Bullet was a 230 grain, full metal jacket "ball" round. The holster was a Blackhawk Serpa designed for the 1911 and was equipped with a trigger guard retention device. The bullet passed through the pants and entered the upper thigh below the point of the hip. The bullet exited just below the knee. The student was immediately cared for by two Front Sight staff members as well as a student who was a medical doctor. First aid in the form of a compression bandage, supplemental oxygen, and vital sign monitoring was administered by Front Sight staff. The student remained very calm with strong vital signs. The student was transported by helicopter to a hospital emergency room in Las Vegas where his wounds were treated and he was discharged. Upon “drawing” the weapon from the holster, the student disengaged the thumb safety on his 1911 way too soon (at Count 1 or 2 instead of Count 4). Additionally, the student’s finger slipped onto the trigger after disengaging the retention device of the Serpa holster. This was a clear violation of Safety Rule 3 and caused the weapon to fire. Incident occurred on October 20, 2011, the final day of a 4-Day Defensive Handgun course at approximately 2:00 p.m.
15 students were on the firing line along with the Front Sight Range Master, three other Instructors, plus the student coaches for a 1-to-1 ratio of students to coaches. The students were at 7 yards shooting headshots from a concealed holster. The weapon was a Glock 34, 9mm caliber handgun with no obvious modifications. The bullet was a 115 grain, full metal jacket "ball" round. The student fired the prescribed headshot but was unhappy with the results. In frustration, he dropped the weapon down to the side of his body. While “dangling” the weapon near his leg, he fired a single round. The student was immediately cared for by a Front Sight staff member. First aid in the form of a compression bandage and vital sign monitoring was administered by Front Sight staff. The student remained very calm with strong vital signs. After firing the prescribed headshot, the student was frustrated and dropped the weapon down to his side…with his finger still on the trigger. This was a clear violation of Universal Firearms Safety Rules #2 and #3. Rule #2 states “never let the muzzle cover anything you are not willing to destroy”. Rule #3 states “keep your finger OFF the trigger until you are ready to shoot.” Violating both of the above rules at the same time, the student inadvertently fired a single round which entered his calf. Remember, the only way a weapon will fire is by pressing the trigger. Incident occurred on April 19, 2012, the final day of a 2-Day Handgun Skill Builder course at approximately 11:00 a.m.
17 students were on the firing line along with the Front Sight Range Master, two other Instructors, and the student coaches for a 1-to-1 ratio of students to coaches. The students were at 7 yards shooting “Failure to Stop” drills from a concealed holster. The weapon was a Smith & Wesson M&P, 9mm caliber handgun with no obvious modifications. The holster was manufactured by Fobus. As the student was “drawing” his weapon from a concealed holster, he fired a single shot just as the muzzle cleared the top of the holster. The bullet passed through the pants and entered the leg a few inches below the holster. The bullet traveled under the skin for about 8” before exiting just above the knee. As the student was drawing his weapon from the holster, he immediately and erroneously placed his finger on the trigger and inadvertently pressed. This was a clear violation of Universal Firearms Safety Rules #2 and #3. Rule #2 states “Never let the muzzle cover anything you are not willing to destroy.” Rule #3 states “Keep your finger OFF the trigger until you are ready to shoot.” Violating both of the above rules at the same time, the student inadvertently fired a single round which entered his leg. Remember that the proper "draw" stroke involves keeping your finger out of the trigger guard and off the trigger until the weapon is pointed downrange at the target. Again, the only way a weapon can be fired is to press the trigger. Incident occurred on March 28, 2013, the final day of a 4-Day Defensive Handgun course at approximately 10:45 a.m. The students were at 5 yards shooting “Multiple Target” drills from a concealed holster. The students were shooting only under the direct supervision of a Front Sight staff member. Thus, the student was working one-on-one with an instructor. The weapon was a Springfield XDM, 9mm caliber handgun with no obvious modifications. The holster was also manufactured by Springfield. The bullet entered the right leg, high on the thigh, near the bottom of the holster. The bullet traveled through the thigh and exited the inside of the thigh about six inches above the knee. The bullet then entered the left calf where it came to rest in the muscle. The student was immediately cared for by Front Sight staff members as well as paramedics and firefighters who were in the course as students. First aid was in the form of a compression bandage and vital sign monitoring. The student remained very calm with strong vital signs. The student was transported by helicopter to a hospital emergency room in Las Vegas. The student was discharged just a few hours later and is expected to make a complete recovery. Incident occurred on June 19, 2013, the third day of a Four-Day Defensive Handgun course, shortly before 11:00 a.m. Approximately 20 students were on the firing line along with the Front Sight Range Master, Instructors, and other Line Coaches. The student was shooting a Glock 24 handgun chambered in 40 S&W and the ammunition was factory hard ball. The students were on the 7-yard firing line shooting designated head shots at static targets from concealed holsters. The student was generally performing well with no indications of safety violations. At the conclusion of the firing drill, the student experienced a Type 3 malfunction. Instead of clearing it properly in accordance with the Front Sight method, the student allowed the muzzle of the weapon to point down toward the ground, thereby covering his foot. The student then racked the slide of the weapon while his finger was on the trigger. The student inadvertently fired a single shot which struck him in the right foot. The bullet passed completely through his foot and exited through the bottom of his shoe. The student was immediately cared for by Front Sight staff as well as medical professionals who were in the course as students. First aid in the form of vital sign monitoring was administered by Front Sight staff. The student remained calm with strong vital signs. The student was transported by ambulance to an emergency room in Las Vegas. He is reportedly doing well and is expected to make a full recovery. This was a clear violation of Universal Firearms Safety Rules #2 and #3. Rule #2 states “Never let the muzzle cover anything you are not willing to destroy.” Rule #3 states “Keep your finger OFF the trigger until you are ready to shoot.” The student simultaneously violated both of these fundamental safety rules by allowing the muzzle to cover his foot and placing his finger on the trigger before he intended to shoot. If these two safety violations had not occurred, there would not have been a Negligent Discharge and subsequent injury. Adherence to the four safety rules is the only way to guarantee safe weapons handling. Incident occurred on August 22, 2013, the fourth day of an Instructor Development course at approximately 9:30 a.m. The students were at 15 yards shooting timed controlled pair drills from an unconcealed holster. The students were shooting under the direct supervision of a Front Sight staff member. Thus, the student was working one-on-one with an instructor. 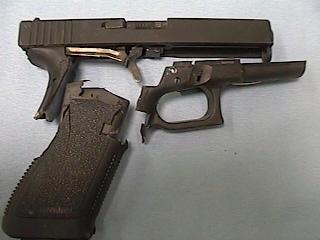 The weapon was a Glock 22, .40 S&W caliber handgun with a modified trigger and an after-market 9mm conversion barrel. The bullet was a 115 grain, 9mm full metal jacket "ball" round. The holster was manufactured by Blade Tech and was in good condition. The students were instructed to unload their weapons following the completion of a live-fire range exercise. As the student was “drawing” his weapon from an unconcealed holster, he fired a single shot just as the muzzle cleared the top of the holster. The bullet entered the right leg, high on the thigh, near the bottom of the holster. The bullet traveled through the thigh and exited the front of the thigh about six inches above the knee. The student was immediately cared for by Front Sight staff members. First aid was in the form of a compression bandage and vital sign monitoring. The student remained very calm with strong vital signs. Incident occurred on September 12, 2013, the final day of a four-day defensive handgun course at approximately 9:00 a.m. Approximately 15 students were on the firing line along with the Front Sight Range Master, three other Instructors, plus the student coaches for a 1-to-1 ratio of students to coaches. The students were at 15 yards shooting controlled pairs from a concealed holster. Weapon used was a Les Baer brand 1911 45 ACP caliber handgun. The holster was made by Blade Tech and was in good condition. The bottom portion of the holster was blown off and the bullet passed through the pants entering the upper calf just below the knee. The bullet did not appear to exit. The student was immediately cared for by Front Sight staff members. First aid in the form of a compression bandage was administered by Front Sight staff. The student remained very calm and declined transport by ambulance. The student was transported by a family member in a private vehicle to a hospital emergency room in Las Vegas where his wounds were treated and he was discharged. The student attempted to reholster the weapon after the firing exercise with the thumb safety disengaged and his finger still on the trigger. When his trigger finger hit the top of the holster, his finger inadvertently pressed the trigger. This was a clear violation of Safety Rule 3 which mandates keeping your finger out of the trigger guard and off the trigger until the weapon is pointed downrange at the target. Additionally, the thumb safety should have been turned on (engaged) well before attempting to holster. Incident occurred on October 30, 2013, the third day of a four-day defensive handgun course at approximately 3:00 p.m. Approximately 17 students were on the firing line along with the Front Sight Range Master, three other Instructors, plus the student coaches for a 1-to-1 ratio of students to coaches. The students were at 10 yards shooting controlled pairs from a concealed holster. The weapon was a Glock 19, 9mm handgun. The bullet was a 115 grain, full metal jacket "ball" round made by Remington. The holster was made by Black Hawk and was in good condition. The bullet passed through the bottom of the holster, entered through the pants, and grazed along the upper thigh. The bullet never actually entered the leg but instead caused a deep abrasion of about 3-4” in length. First aid in the form of a bandage dressing and vital signs monitoring was administered by Front Sight staff. The student remained very calm and declined transport by ambulance. The student was transported by a family member in a private vehicle to a hospital emergency room in Las Vegas where her wounds were treated and she was discharged. The student attempted to reholster the weapon after the firing exercise with her finger still on the trigger. When her trigger finger hit the top of the holster, the finger inadvertently pressed the trigger. This was a clear violation of Safety Rule 3 which mandates keeping your finger out of the trigger guard and off the trigger until the weapon is pointed downrange at the target. Incident occurred on March 16, 2014, the third day of a Four-Day Defensive Handgun course at about 4:20 p.m. There were 16 students on the firing line along with five Front Sight staff members including the Range Master, Instructors, and Line Coaches. The student was shooting a Fusion brand 1911 handgun and using a Blade Tech kydex holster. The ammunition was factory CCI Blazer 230-grain hard ball. The students were on the 7-yard firing line shooting controlled pairs at static targets with no time pressure. The bullet passed through the student’s pants and entered the leg about 5-6” below the point of the hip. The bullet travelled under the skin and exited the back of the leg just below the calf. The student was immediately cared for by qualified medics from Front Sight staff as well as the student body. First aid in the form of compression bandages and vital sign monitoring was administered. The student remained calm with strong vital signs. The student was transported by helicopter to an emergency room in Las Vegas and was soon released. The student did not engage the thumb safety and place his trigger finger straight along the side of the frame after his last exercise and before holstering. This resulted in attempting to holster a loaded weapon with the safety off and finger on the trigger. Adhering to the proper safety rules and correct gunhandling is the only way to guarantee safe weapons handling. Incident occurred on May 21st, 2014, the third day of a Four-Day Defensive Handgun course at about 10:20 a.m. There were approximately 18 students on the firing line along with four Front Sight staff members including the Range Master, Instructors, and Line Coaches. The student was shooting a Springfield XDM handgun and using a Blade Tech kydex holster. The ammunition was factory 9mm 115-grain hard ball. The students were on the 3-yard firing line shooting controlled pairs at static targets with time pressure. The student had completed the exercise and was holstering. While holstering she encountered difficulty getting the weapon back into the holster. While trying to correct the problem her trigger finger got into the trigger guard and depressed the trigger. Thus, she violated two fundamental safety procedures while holstering. She violated rule two by allowing her muzzle to cover a portion of her body, and rule three by allowing her trigger finger on the trigger when she did not intend to fire a round. If these two safety violations had not occurred, there would not have been a Negligent Discharge. When her trigger finger contacted the top of the holster, the weapon discharged. Powder burns on the student’s pants and at the muzzle end of the holster indicate that the weapon was fired while the gun was at least partially in the holster. Additionally, a large piece of the holster was destroyed when the negligent discharge occurred. The bullet passed through the student’s pants and entered the right foot immediately behind the origin of her second toe. The bullet travelled through her shoe, her foot, and exited through the sole of the shoe into the ground. The student was transported by ambulance to an emergency room in Pahrump and was soon released. She returned later that day and completed day three and all of day four. The student did not follow rule three and and place her trigger finger straight along the side of the frame during holstering. This resulted in attempting to holster a loaded weapon with her finger on the trigger. Adhering to the proper safety rules and correct gun handling is the only way to guarantee safe weapons handling. Incident occurred on May 28, 2016, the second day of a Two-Day Handgun Skill-builder course, at approximately 1:30 p.m. Approximately 20 students on the firing line with three Front Sight instructors observing and instructing the 20 students on the firing line. A ratio of one instructor for every 6.5 students. Student was presenting his weapon from a concealed holster when the incident occurred. Bullet was 115 grain, full metal jacket, "ball". The student was shot in the support (left) hand. The bullet entered the palm side of the hand halfway between the little finger and the wrist. The bullet exited through the back of the hand. On-site medical care was delivered by Front Sight's medical and operations staff. Medical care was in the form of a compression bandage. The student was in pain but was able to move each of his fingers and had sensation in each of his fingertips. The Nye County Sheriff's office was notified of the incident with no further action needed. This student arrived for his Skill-Builder course after significant experience in the techniques we teach. Based on the accounts of the instructional staff on his range, he was doing very well up until his injury. The five-count presentation exists to allow the shooter to rapidly, consistently, and safely deploy their concealed firearm to counter a deadly threat. The individual steps were designed, and have been time-tested, to provide the quickest path from holster to target while avoiding any type of self injury. When these steps are performed incorrectly, as in the case of this incident, injury results. Most of the self-inflicted gunshot wounds that have occurred at Front Sight over the years have resulted from the individual getting in a hurry and skipping a required step, or performing one or more required steps incorrectly. Thankfully, this incident, and the other gunshot wounds we have seen in the past, likely will not result in permanent loss of function of the affected body part for the injured students. The best thing that each of us can do to insure such injuries do not happen in the future is to learn from past mistakes, ALWAYS obey the 4 Rules of Firearms Safety, and to slowly and perfectly perform each and every technique over and over until we can do them in our sleep. Speed comes with perfect practice, not extra effort! Incident occurred on 21 April 2018, on the second day of a Four-Day Practical Rifle course, at approximately 3:30 p.m. The student was an experienced shooter, having participated in eleven courses at Front Sight prior to this one. Student was performing a firing drill at the 7 yard line when the incident occurred. The student had fired at the target and gone into After Action Drills when a jacket from a round fired by another student ricocheted off the berm and struck the student in the neck, causing a superficial wound. Medical staff was notified by range personnel, and immediately headed to the Rifle Range, where a fellow student who was a Paramedic provided first aid in the form of a 4x4 gauze pad and direct pressure. Because of the location of the wound, the Paramedic also recommended a cervical collar, which was provided and placed by Front Sight medical staff. Once Front Sight staff were aware of the wound's location, a request for an ambulance was called in and dispatched by the Pahrump Valley Fire Department. The student was treated and released and is looking forward to finishing her Practical Rifle course.. The freak nature of this incident reinforces the importance of always wearing the proper safety gear (especially impact resistant glasses) and the proper clothing while training on the range. The students did nothing wrong procedurally, and were all wearing the required safety equipment. Incident occurred on 28 October 2018, third day of a 4-Day Defensive Handgun course at approximately 4:00 p.m.
20 students were on the firing line along with the Front Sight Range Master, two other Instructors, and the student coaches for a 1-to-1 ratio of students to coaches. The weapon was a Walther PDQ-M2, 9mm caliber handgun with no obvious modifications. The holster used was a Kydex holster. The student was an experienced shooter, having taken 14 courses previously. As the student was drawing (presenting) his weapon from a concealed holster, he fired a single shot just as the muzzle cleared the top of the holster. The bullet passed through the pants and entered the leg a few inches to the side of the holster. The bullet traveled under the skin for about 6” before exiting. The wound channel was very shallow. The student was immediately cared for by a Front Sight staff member and one of his friends, who was also a LA County Fire Paramedic. First aid in the form of a 4 x 4 and direct pressure was applied by his friend and vital sign monitoring was administered by Front Sight staff. The student remained very calm with strong vital signs. Nye County Fire and Rescue ambulance arrived at 4:45 p.m., at which point the student refused transport. He left in his own vehicle and said he would seek medical attention in Las Vegas. As the student was presenting his weapon from the holster, he immediately and erroneously placed his finger on the trigger and inadvertently pressed. This was a clear violation of Universal Firearms Safety Rules #2 and #3. Rule #2 states “Never let the muzzle cover anything you are not willing to destroy.” Rule #3 states “Keep your finger OFF the trigger until you are ready to shoot.” Violating both of the above rules at the same time, the student inadvertently fired a single round which entered his leg. Remember that the proper "draw" stroke involves keeping your finger out of the trigger guard and off the trigger until the weapon is pointed downrange at the target. Again, the only way a weapon can be fired is to press the trigger. Incident occurred on 19 February 2019, the second day of a Two-Day Handgun Skill Builder course around 09:30. Approximately 20 students were on the firing line along with the Front Sight Range Master, Instructors, and Student Coaches. The student was shooting a Smith & Wesson M&P9 handgun and using 9mm 115-grain factory hard ball ammunition. The students were on the firing line shooting controlled pairs at turning targets from concealed holsters). The student had completed the exercise and was holstering. However, he violated one fundamental safety procedure by leaving his trigger finger on the trigger. If this safety violation had not occurred, there would not have been a Negligent Discharge. The bullet passed through the student’s pants and entered into his thigh. The bullet did not exit the leg. The student was immediately cared for by Front Sight staff until the medical staff arrived. First aid in the form of a compression bandage and vital sign monitoring was administered by Front Sight medical staff. The student remained calm with strong vital signs. The student is looking forward to continuing his training after he recovers. The student was transported by Life Flight helicopter to UMC in Las Vegas and is expected to make a full recovery. The student did not place his trigger finger straight along the side of the frame after his last exercise and before holstering. This resulted in holstering a loaded weapon with his finger on the trigger. Adhering to the proper safety rules and correct gunhandling is the only way to guarantee safe weapons handling. As the students involved in the above incidents have requested, let their negligent discharges be a learning experience for all. Again, realize that millions of presentations are performed every year at Front Sight without incident by students of various experience levels, many of whom have never shot a gun before in their lives. This clearly demonstrates Front Sight's stellar safety record and proves that if you learn the proper techniques to present your weapon from the holster, you too can be fast, effective, accurate, and safe.